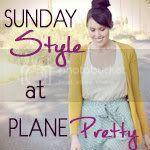 What a great weekend look! I loooove that scarf with that top- so gorgeous! Can you believe I tried Chipotle FOR THE FIRST TIME this past Friday night? It was pretty great! Victoria's secret has two that are pretty good. I've used the oil free one because, well, I'm oily. They're a little cheaper, at $18 for 21 g/.75 oz the regular one and $18 for 25 ml/.84 fl oz the oil free one. will i see it online? are there just the 2 kinds so i cant miss it? 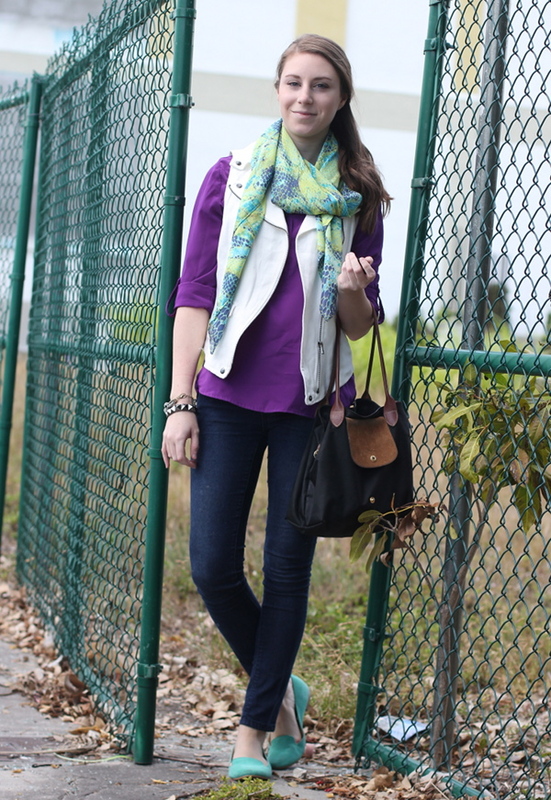 I love this outfit - I don't know if I would have thought to pair that scarf with the color of your shirt, but it totally works! I have the same shirt in navy and gray - I love it :) Also, the color of your shoes is just lovely!! I don't use a primer as I use a BB cream but I heard there's like a diaper rash cream or something that works just as well. Ugh, I read about it on the favorite makeup thread on gomi I think, but I haven't tried it out because...I don't use a primer. Man, I'm not very helpful am I? I use the Smashbox primer at least 2/3 of the month and have been using the same tube since July! One regular sized tube will definitely last quite a while. I've read that many people find ELF's Mineral Primer (I believe $6 at Target) is a dupe for the Smashbox Primer. It might be worth looking into! I personally love the primer by Bare Minerals which is around $21, I believe. I know I only need to buy a couple tubes a year. And you could sample them at Ulta or Sephora as well for a slightly cheaper option! Smashbox is really the best, but a lot of people use monistat chafing gel as a cheaper replacement. It really does have similar ingredients, but it feels awkward to buy. 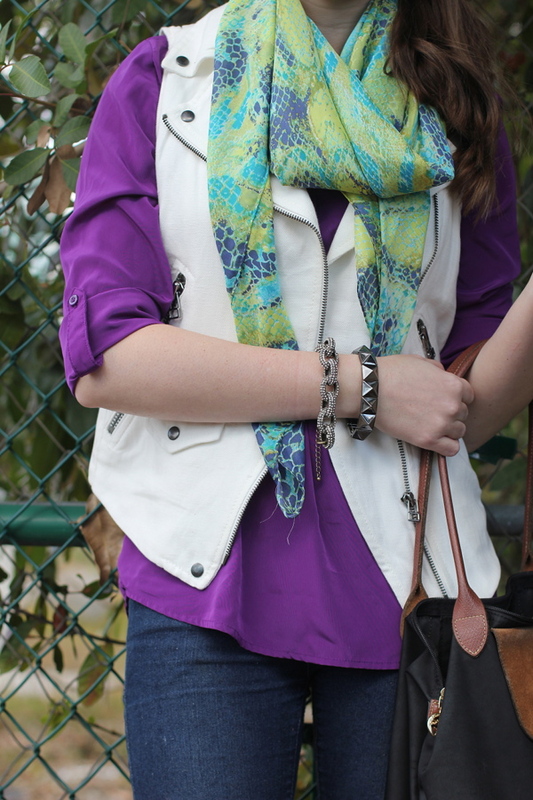 Love your green and purple together and am obsessed with that leather vest!! Great look lady! thanks so much for the info! i might be a little embarrassed buying chafing gel, but i think it's worth it to save a lot of money! oo thanks for the suggestion! I'm down for spending 6 bucks over 36! Yes, I order it online so I don't have to deal with the embarrassment! I'm definitely going to check out Smashbox. I'm in need of a primer! I was just going to mention that stuff! A neat trick I found online is to mix it with your foundation before applying it. It really helps. I seal it with Hardy Candy mutifying powder. Elissa, that color combo is fabulous! (Love the shoes). And i have to second Emily below on the Monistat gel - I know I know I know it's an awkward thing to buy, but seriously it's exactly the same and you can get it for $4-5! Love your bag! And fun shoes. Thanks for stopping by my blog. Agreed about the chafing gel. I don't personally use it (I swear, right when my current primer is about to be used up, I end up getting my hands on another deluxe size sample of a decent primer, so I rarely have to buy one and don't mind spending the money when I do! ), but I know TONS of girls who swear by it! I used to swear by the ELF primer. It seriously is amazing stuff and feels like a dream when you put it on! I am so jealous of your Longchamp bag. That scarf is SO gorgeous too!